Caitlin's history actually starts a generation before, with her father, Alex Fairchild. Alex was a soldier in the US Special Forces, later recruited into the super elite special ops team designated Team 7. Amongst his teammates was a young Charles Xavier. Due to experiments with radioactive material, Alex, along with a handful of others, were given psychic and metahuman powers. Little did they know that these powers would be handed down to their offspring. Years later, Caitlin was born, yet never got to see her father, having been told that he was killed in the line of duty. Throughout her childhood, she'd always been visited by "Uncle" Charles. Eventually, Charles would convince Caitlin's mother to enroll her in his Academy for Gifted Youngsters. Once a member of the school, Cait couldn't understand why she was there. She was known as a genius and learned quickly. She did not have the powers that the other students had. Charles knew that there was something latent in her, and it finally manifested by the time she was 18. Once a mousy and shy, scrawny bit of a girl, she had hit a transformation, growing up to over 6 feet tall and her muscle density to grow exponentially. She filled out nicely, and for some reason did not look like she was packing that much weight. Instead of adding mass and weight, her body added density. For another couple years, she trained at Xavier's in hand-to-hand combat as well as pushing her new body and it's abilities. 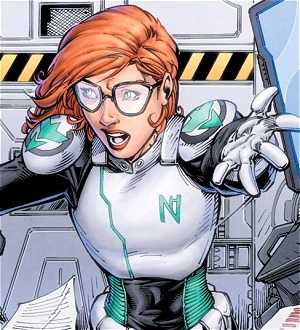 While staying at Xavier's and training in her powers, she was accepted and went to school at Princeton University, taking only a few years to earn a double major in computer science and electrical engineering. Once Caitlin had graduated, Charles had pulled Caitlin aside and recruited her for a special mission. Her intellect was necessary to earn her a spot on the research team of a special project that was starting up, something totally Black Ops. Xavier used his contacts to allow Caitlin's file to land in the hands of this shadow organization, and she was hired. This organization was called Project: Rebirth. In an effort to reboot the Super Soldier Program from WWII, the scientists had squads that would go out and kidnap metahuman teens in an effort to augment and extract metahuman abilities and place them into soldiers that they control. These children became test subjects and were treated as objects. Xavier strongly opposed this and wanted Caitlin to be his eyes inside the complex. She currently works as a lab assistant in the organization and once in a while sends reports back to Charles. Caitlin doesn't see the changes to her physical body. She still sees herself as the mousy student that walked into Xavier's. She tries to overcompensate with her intellect and is eager to do anything she can to prove herself. Caitlin is goal-oriented, and right now her mission for Xavier is her life. She regularly sends information and keeps an eye out for the test subjects. She's also hoping that Xavier planted her there in order to rescue the children, however he never said anything about action, just intelligence gathering. Caitlin is an empathic and caring soul. She doesn't want to hurt people and doesn't want to see them hurt. Witnessing some of the experiments upsets her, but she tries hard to keep calm in order to get the information and give it to Charles. Eventually she won't be able to stand by and witness the abuse without doing something. Caitlin is socially awkward. Even though she has the looks of a well-built supermodel, she still considers herself to be a skinny, mousy nerd of a girl. She also hides her personality behind her intelligence. Unfortunately now she can do the same with her appearance. Though she's proven herself at Xavier's, she still doesn't believe that she's the best person for this mission. Her lack of belief in herself can make her stumble or become useless at a critical time. Her sense of duty is her motivation. She's on a mission from Xavier and wishes to see it through. She wants to see these children being used rescued and brought to somewhere safe. She wants all children to be safe and cared for. Cait's immediate goal is the rescue the children being experimented on and shutting down the program. After that, she wishes to ensure that places like Project: Rebirth never happen again. Caitlin's metagene activation caused her proportions and muscle density to increase exponentially. Her tissue density causes her to weigh far more than her hourglass figure would suggest, tipping the scales at 300 pounds. She can lift well over 50,000 tons under normal conditions. She's also considered one of the strongest students at Xaviers, considered just below Supergirl. Fairchild is virtually invulnerable and can absorb a tremendous amount of physical punishment without injury. She has fallen from great heights onto solid concrete and walked away unharmed. Her bones are nearly unbreakable and her skin can withstand puncture even by bullets. Caitlin can exert herself well beyond peak human endurance levels without tiring or even growing short of breath. Her upper limit for durability is the same as Supergirl's. Caitlin is far more dexterous and agile than a normal human and is capable of impressive acrobatic feats, especially when combined with her superhuman strength. She can keep up with the likes of Beast and Spider-Man. Caitlin never wanted for much in life. Her father had somehow set up a trust fund to help Caitlin with expenses. She's not rich by any means, but necessities are taken care of. This is Caitlin's source of income, as it is her job. Of course, she's looking to take down the entire organization. Her loyalty is not to her job. She lives in designated quarters at the complex, so has no need of her own housing at the moment. Caitlin has very limited one-way contact with Charles. She continues to send information to him, hoping that at some point he'll get a message to her green-lighting some sort of rescue and takedown. She cannot call on him for any sort of help, and does not receive confirmation that he's received any of her messages. Caitlin possesses a remarkably advanced Intellect, majoring in both computer science and electrical engineering at the Ivy League level. She is a talented computer whiz and has skills comparable to that of of a high-level programmer and hacker. She's also a competent research level scientist, easily capable of handling her job as a lab assistant. 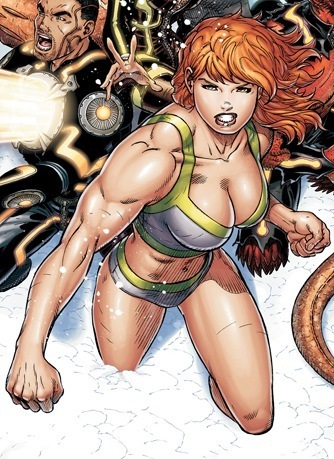 Thanks to extensive training at Xavier's, Fairchild is a formidable hand-to-hand fighter, and has learned how to use her great strength and other superhuman physical abilities to her advantage in battle. Though reluctant, Caitlin is a natural leader and has taken charge in team activities at Xavier's. She has developed a keen understanding of battle strategy, and her teammates instinctively follow her lead whenever a combat situation arises. Caitlin is able to dismantle, analyze and put back together any form of computerized equipment, the more like a computer, the better. She's also proficient in high-level programming and can write scripts, trojans, and all kinds of virus attacks if she needed too. She's devised her own email encryption key and sends weekly information to Xavier this way. On top of knowing computers inside and out, she also understands electrical circuitry and how electronic devices work. It's not an innate ability, like talking to machines (ala Forge) but she can fix nearly any type of electronic device and make it work to her needs. Caitlin's cover at Project: Rebirth is that of a lowly lab assistant. If they knew of her true intentions or of who she was really working for, the results would be disastrous. Though she doesn't look it, Caitlin carries around a body mass of 300lbs. If she's not careful as to how she walks or where she sits, she could cause some damage to her environment and others around her.